Set against the backdrop of second year highschool, One Week Friends follows Yuki Hase as he endeavours to befriend and then stay friends with Kaori Fujimiya. Kaori Fujimiya was a loner, withdrawn from her classmates, when Yuki Hase decided to approach her. He quickly learns that Kaori suffers from memory loss problems – her memories reset every Sunday night, making it difficult for her to make friends at all. Despite this obstacle, Yuki Hase remains determined to be Kaori’s friend and the story follows the development of their relationship from there. The premise of One Week Friends is what caught my attention in the beginning – it sounded like, and sold itself as, a heartwarming story of friendship that flourished in the face of brain trauma. However, this interesting twist on the standard boy-meets-girl-and-they’re-both-awkward-at-each-other formula does not take long before the feature becomes a gimmick watered down by more and more specific conditions that cause the memory loss. The internal logic of the story breaks down equally quickly as Kaori continually clarifies why she remembers certain people or lessons and not others. Friends, it seems, she cannot remember because of a childhood trauma she endured. That being the case is cliché but not a deal killer, not until One Week Friends delves further into its gimmick and announces just why Kaori has the issues she does. Hint: it’s not the brain trauma we’re led to expect. This watering down and lessening of One Week Friends’ selling point took the teeth right out of the premise for me and forced me to look at the show a different way. Looking past the gimmick that One Week Friends employs reveals a series of sweet and warm encounters that mirrors real-life friendships relatively well. I found myself relating to several episodes and was glad for it – One Week Friends at least got the warm fuzzy feeling right. In the end, though, that warm fuzzy feeling isn’t enough to pull the show through. 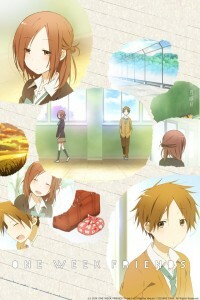 Ine on episode, Yuki Hase takes credit for all the character development that Kaori Fujimiya has experienced, and a completely secondary ‘childhood friend’ is introduced late in the series for the sole reason of forcing a hard reset on Kaori… after which nothing is done with him except to demonstrate that even in high school the ‘I hate you means I like you’ trope apparently still exists. Even as we see Yuki’s feelings grow, the audience is given precious little insight into Kaori’s true feelings regarding Yuki. The series’ finale, after all the buildup and character development, is a letdown, calling into question what the point of the entire exercise was to begin with. Don’t misunderstand, the characters experience quite a bit of development, especially where Kaori Fujimiya is concerned, but they plateau towards the end of the series, and even the arbitrary introduction of a male competitor doesn’t tip them into more development or conclusion. The series’ animation and music was pretty standard – nothing hugely amazing, but the story didn’t require a lot of flash or flare either. Attention to detail was evident in ways accessories would shift or other minor motions, and that was very much appreciated. The colour palettes also helped to achieve the pleasant glow of childhood. I really wanted to like One Week Friends, but it doesn’t quite live up to what it was selling itself as. If you like the warm fuzzies and awkward, shy laughter of high school kids then you’ll likely enjoy this show. If, however, you want a bit more meat to your shoujo stories, this is a pass. Overall, it’s not a bad series but it doesn’t push as far as it was aspiring to.